Westray is the most north-westerly of the large islands that make up Orkney. 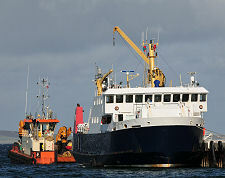 Regular ferries connect Rapness Pier, near its southern tip, with Kirkwall. For current fare and timetable information, and for bookings, contact Orkney Ferries as shown on the right or via their website. 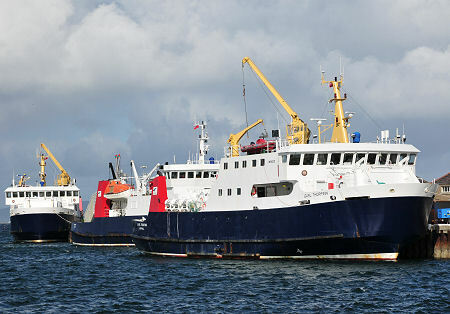 The service to Westray is operated by three of Orkney Ferries' vessels, the MV Earl Sigurd, the MV Earl Thorfinn and the MV Varagen. 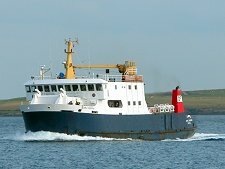 On this page we focus on the two "Earls", giving more information about the MV Varagen on the feature page covering the Stronsay, Sanday and Eday Ferries, which are operated by the same three vessels. 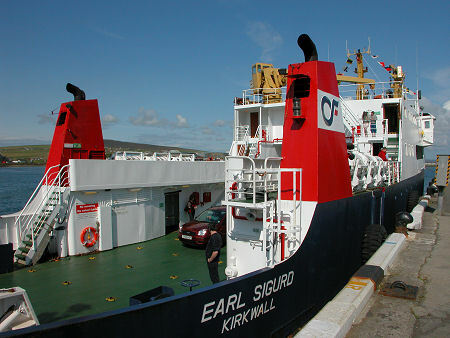 The MV Earl Sigurd and the MV Earl Thorfinn each carry up to 190 passengers and 25 cars. The ships are identical and were built by McTay Marine at Bromborough on the River Mersey, though fitting out was undertaken at St Monans in Fife. 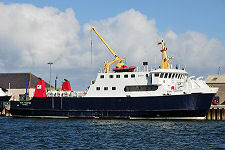 The ships arrived in Orkney in August and November 1990 and immediately entered service on the routes serving the northern islands from Kirkwall. 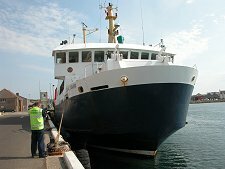 Their names had long associations with Orkney, being inherited from steamers which provided inter-island services from the 1930s until the end of the 1960s. The two Earls initially served on traditional routes to the harbours served by their predecessors, using their 7 tonne cranes to load and unload cargo and vehicles. 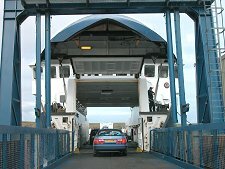 It took a further two years for the completion of the ferry terminals needed for roll-on roll-off service to operate to the main northern islands. 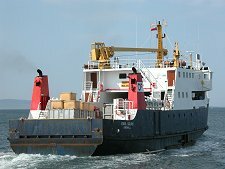 Since then the Earls have operated much as they do today, though their cranes continue to serve on the twice weekly sailings to Papa Westray and the weekly sailings to North Ronaldsay, whose piers have not been adapted for roll-on roll-off services. 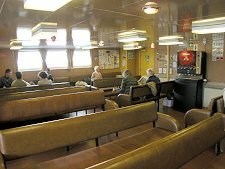 Accommodation on the Earl Sigurd and Earl Thorfinn could perhaps best be described as functional: designed to accommodate passengers for routes typically of around 1½ hours adequately but without any sense of unnecessary luxury. 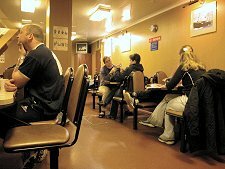 An upper lounge is located behind the bridge, complete with TV and vending machine, while the large cafeteria, complete with superb bacon rolls, is found under the vehicle deck. Those who prefer to do their sailing in the open air have a choice between well sheltered areas on either side of the ships beneath the bridge or the rather less well sheltered areas towards the rear of the ship, either side of the open part of the vehicle deck. 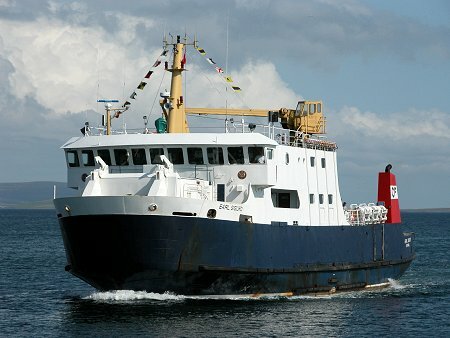 The route to Westray takes the ferries out of Kirkwall Bay and along the west side of Shapinsay, before running up with Egilsay and Rousay to the west and Eday to the east. 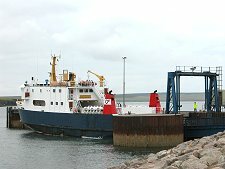 The ferry terminal on Westray at Rapness Pier is some 7 miles south of Westray's main village, Pierowall, and there is a bus connection between the two. 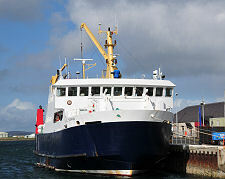 If you want to make use of this, speak to Orkney Ferries staff when buying your ferry ticket.